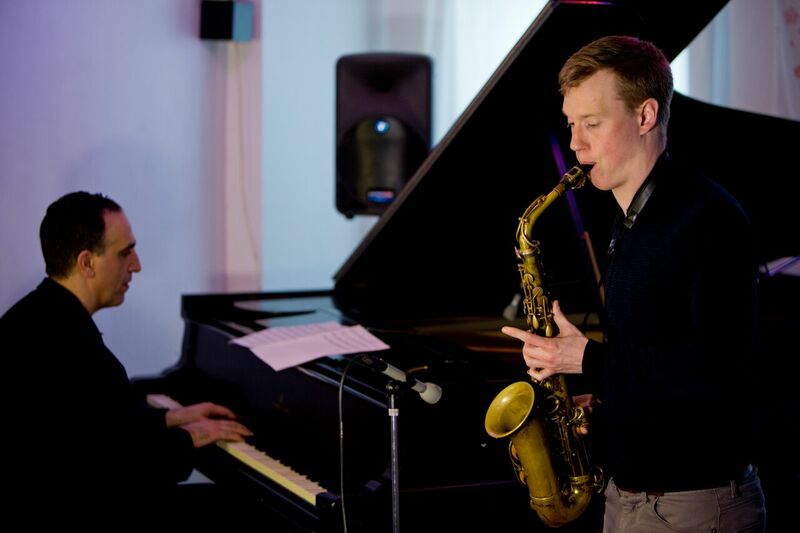 This was a home gig for young London-based but Norfolk-born alto saxophonist Sam Braysher, currently on a European tour with celebrated New York pianist Michael Kanan. Kanan is well known in New York for performing and recording with Kurt Rosenwinkel and Jorge Rossy, among others, and as accompanist and arranger for Jane Monheit. He has his own trio too. Braysher also leads his own trio, and has performed with various musicians including Jorge Rossy, John Warren, Barry Green and the London Jazz Orchestra. In New York, the pair recorded a very well-received duo album in 2017, Golden Earrings, which is a fresh take on some of the farther reaches of the Great American Songbook, and they continue this exploration on the current tour. They performed in the recital room at the Anteros Arts Foundation in Norwich. It’s a great setting for chamber music – an upstairs room in a Tudor mansion. It is filled with wood, from the beautiful roof beams to its disconcertingly undulating floorboards, and the space resonates like a music box. There is a fine 1927 Steinway and room for about 50 seats – the perfect spot for an intimate concert. Braysher and Kanan appear to have a very relaxed working relationship. They have no fixed play list, they prefer to see where the evening will take them. They deliberated which tunes to play and in which key as they went along. At one point Kanan said “Yeah, I’m going to play some Gershwin”, and Braysher went and sat down in the great inglenook, until moved to join in. The way they improvise together feels like listening in on a conversation. Sometimes they appear surprised by the music which they have just conjured up, and after a particularly pleasing duet or solo they smile at each other. It makes the audience feel happy too, to witness this authentic jazz alchemy. They played mainly popular tunes from the likes of Jerome Kern and the Gershwins, each one helpfully introduced by one or the other. They are meticulous in crediting composers for each tune – often adding some interesting background information. Their approach to these old melodies is a breath of fresh air. Given that so many years have passed since they were the popular songs of their day, musicians now have to study to learn the standards, and Kanan is an expert. Both have turned to the original sheet music for inspiration, rather than the myriad reinterpretations by jazz musicians over the years. As a result, their melodic take on the old treasure trove is entirely their own. Their version of Unbelievable was cool and jaunty, almost Façade-like in its pared down ragtime. Other tunes sent me to those scenes, in almost every Broadway musical, of dancers in rehearsal rooms with an upright piano. They played one English entry in the Great Songbook, The Very Thought of You, in which they wandered off into a jazz reverie before one of the neat conclusions in which every tune resolved. Some songs suggested Strayhorn’s demi-monde of “jazz and cocktails”, others the elegance and complexity of some baroque invention for two voices, it really was terrific stuff. Braysher and Kanan also played a couple of pure jazz compositions, including Thelonious Monk’s Introspection with brilliantly sure syncopation on the piano and fluid soloing from the saxophone. On Stella By Starlight, the duo were joined by tenor saxophonist Martin Eaton, one of Braysher’s former music teachers, a charming moment. Braysher’s mother, who was sitting in the front row, requested Way Down Yonder In New Orleans, the only song they played from the CD. Unsurprisingly, they played a totally different version to the recorded one. There was an thrilling section where Kanan played a single line on the piano in counterpoint with Braysher’s, followed by a transcribed Lester Young solo, played in unison – delightful. They finished with an encore – All The Things You Are, filled with intricacy and elegance – and the audience loved it. Like the last time I saw them, I had the feeling that we had barely scratched the surface of what these two inventive musicians could pull out for us from their vast repertoire, and reinvent before our eyes. Braysher and Kanan play with precision, with sensitivity and with heart, and long may their partnership continue! Sam Braysher and Michael Kanan are on tour.